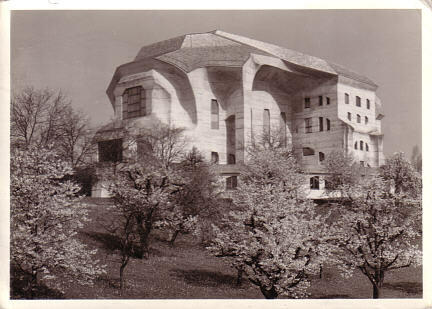 Built 1925-1928 by architects of the Goethanum college and Ebbell, after designs made by Rudolf Steiner in 1924, for the "Allgemeine Anthroposophische Gesellschaft". Named in honor of the German poet and playwright, Johann Wolfgang von Goethe (1759-1832). Opened 1928 while most of the interior was still unfinished. 1928-1998 interior decoration by Ernst Aisenpreis, Albert Baravalle, Johannes Schöpfer, Rex Raab, Arne Klingborg, Conrad Hoenes, Winfried Reindl, and Mathias Ganz. Stained glass windows by Assya Turgenyeva after designs by Rudolf Steiner. The complex comprises two halls and various function rooms. Other buildings in the area include drama and "Eurythmy" schools and a puppet theatre. 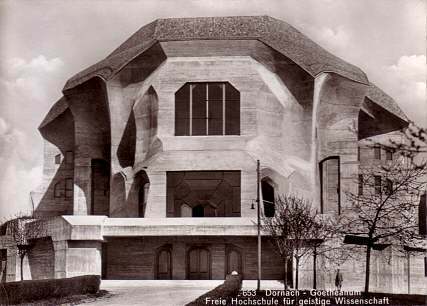 Großer Saal: Opened 1928. Interior decoration 1957 by Johannes Schröpfer. 1996-1998 rebuilding by Christian Hitsch, Ulrich Oelssner, and Jörg Kümmel. 1997 ceiling painting by seven artists. At the time of its opening, the stage was the largest in Europe. Used for drama performances (especially of Rudolf Steiner's "Mysteriendramen" and Goethe's "Faust") and for "Eurythmie" [eurythmy] performances by the resident companies. Also used for guest performances and for concerts. 1000 seats. Grundsteinsaal: Used for smaller and experimental theatre performances and lectures. 450 seats. 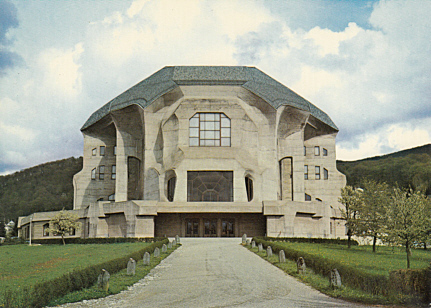 Front Text: "Dornach - Goetheanum - Freie Hochschule für geistige Wissenschaft"
Front Text: "Goetheanum, Freie Hochschule für Geisteswissenschaft, Dornach/Schweiz"
Reverse Text: "Goetheanum, Freie Hochschule für Geisteswissenschaft, CH-4143 Dornach/Schweiz"